You are here: Home / The Appointment Generator / Who is Josh Turner? He is releasing his new improved edition of The Appointment Generator system. I guess you are here because you have heard about this training in a way or another, and want to know more about the guy before you invest in this program, right? Josh is a Wall Street Journal best-selling author, and the founder and CEO of LinkedSelling, a B2B marketing firm specializing in fully outsourced LinkedIn lead generation campaigns. LinkedSelling is currently #252 on the Inc. 5000. They represent many famous clients (like Neil Patel and Microsoft, to name a couple) in the US, Canada, UK, Asia, and Australia, in a variety of industries. Josh’s dad had a small remodeling company. So when Josh was a child, he didn’t suffer like many kids at his age. When he went to college, he started to help his father in his company, just to join him full-time when he was at the end of his college at the age of 22. Then one day, the father told the son that the business is going down, and he has nothing to do but to close the doors of the company. Since then Josh decided that when he build his own business, he won’t leave it to chance to find clients. He’s got his MBA degree in Management in 2006 which has helped him in his starting business career. But his first job was while doing MBA in a company named Boa Construction. He worked there as a cost analyst and finance manager. Josh has started LinkedSelling while he was working with the last company in 2010, but it’s obvious that he didn’t want to risk everything at the beginning. Since then he has helped thousands of businesses grow via LinkedIn, and now has a team of 14 all based in St. Louis. LinkedSelling is not his only product, but he is also the founder of Webinarli; a company for outsourced lead generation via webinars. Now, Josh Turner is releasing one of his finest pieces of work; The Appointment Generator. You can read a full review of this program here. Josh lives in St. Louis, Missouri, with his family and dog Oscar. He likes to play hockey. He also loves camping and backpacking, reading books, building businesses, and is very active in Entrepreneurs Organization. You have to jump on this live workshop. It's hosted by Josh Turner and it’s going to be awesome. AND show you how to build and launch your own powerful appointment generating machine in 30 Days. Imagine yourself a month from now and you’ve got 10 or more high-end appointments, consultations, or strategy sessions to get 5-, 6-, or 7-figure clients ... each month going forward. Without having to spend any money on ads or anything else. That’s what Josh is going to show you how to do. The Foundation – The 3 things you need to do first, to maximize the number of appointments you’re landing. The Email Blueprint – You’ll learn the best way to combine email with LinkedIn and Facebook to get a 10-20% increase in the number of appointments you can book using this system. Josh will also show you how to implement his “warm email” strategy, integrate it with The Appointment Generator system, and AUTOMATE this process - without sacrificing the relationship you've built with your prospects. I don’t know many people more accomplished than Josh in teaching how to get more clients and grow your business from LinkedIn. He’s sharing all his best strategies, processes and scripts in this one – and you’ll kick yourself if you’re not there. Why the small business world is changing, how you can tap into these changes to grow your business, and how to put the systems in place to get off the Cash Flow Roller coaster for good. The #1 reason why most of the "social media gurus" out there are full of crap, why their stuff doesn't get real results, and what YOU can do about it....to change that, and actually start filling your calendar with qualified appointments. The 5 principles that you need to know about in order to maximize the number of appointments you're generating. The 3 things you must do before you get started on anything else. I call this "The Foundation." Without it, nothing else you do will be nearly as effective. How to grow your business without going into debt and relying on paid traffic and unrealistic budgets. And you'll learn the secret weapon to getting more leads and appointments than you can handle. This system is 9 years in the making. It's easy to become the go-to expert in your market when your prospects and clients see you as an authority and a leader. It elevates you above the noise. And it’s the key to getting a consistent stream of new prospects and appointments for your business. 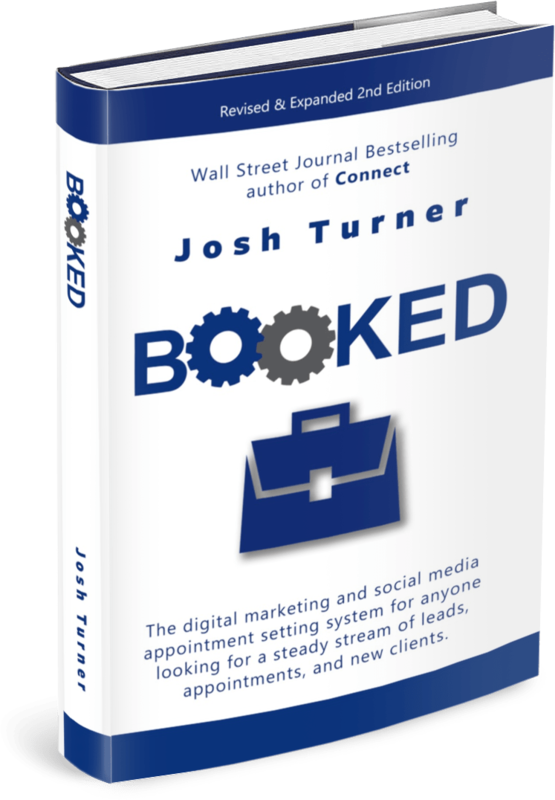 Josh Turner has just rolled out a brand new video and downloadable blueprint walking you through his system. It will show you how to establish yourself as an authority in your market – and how to leverage that status to get a consistent stream of new appointments for your business. In it, Josh will show you how to become the go-to expert quickly by leveraging who you naturally are… and how to use this status to get new clients.. It will shock you how much easier it is to get the phone ringing when you follow Josh’s blueprint. I’ve seen the results his clients get. Let me say, you need to pay attention to this. When your prospects like, know, and trust you – something amazing happens. They begin to not only respond to your efforts to reach out… but they’ll actually SEEK YOU OUT for help, which makes getting clients much easier. Back in the day, achieving this kind of “authority leadership” status took a lot of time and money. But now, with the cutting-edge approach Josh teaches in this blueprint, it’s very systematic – and anyone can do it. And fast. I’ve heard Josh refer to this as “the backbone” of his insanely successful business, LinkedSelling – and it’s transformed the businesses of thousands of his clients as well.